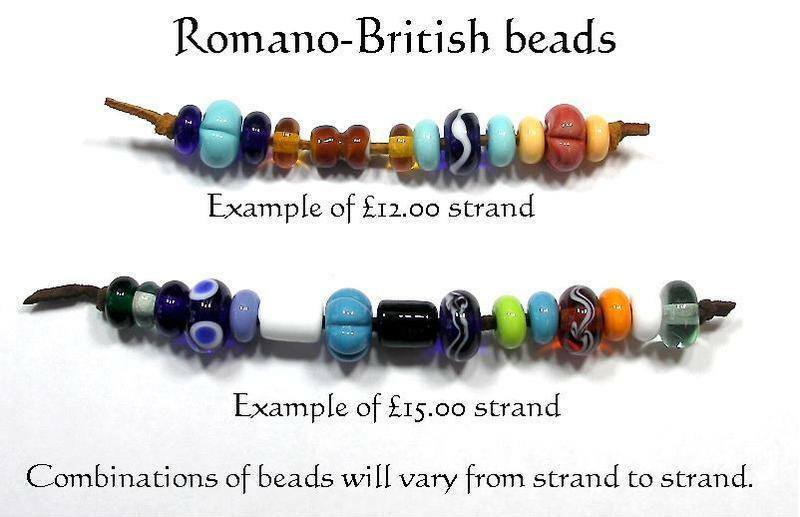 A blend of beads suitable for early Romano-British re-enactors. Each bead is based on information from various sources such as the Guido book on Iron Age and Romano-British beads. The basic set of beads includes a variety of decorated and plain beads, which may include shaped beads such as melons, decorated beads such as polychrome cable or wave beads and monochrome annular beads and will contain approximately 4 decorated/shaped beads and 4 spacer beads. You can choose a larger selection of beads from the drop-down menu, the basic set is set at £12, the other sets are priced as shown in the menu. The image shows a sampling of the variety of beads that may be included in your set. Each set will contain a different selection of beads with approximately 2.2mm holes. The sets are temporarily strung on a cord.